Ireland really is a beautiful country. Even if you’ve never been here, you could guess what the weather is like in the early fall—some light showers, mostly cloudy, temperature hovering around 60 degrees. The weather can be harsher than this, but we’ve been blessed on this trip, and not only with the weather. The environment here helps explain the sturdy character and warm heartedness of the Irish people. They’ve dealt with great hardships over the years, but have developed a resilience and humor that helps them abide. And since the island was converted to the Catholic faith long ago, their national character has been associated with the faith, still evidenced in the ancient churches and monasteries, the names of streets and neighborhoods, and the fact that Irish priests spread the faith all over the world in the last couple of centuries. The Irish character is, however, being tested these days. After years of secularist assaults from Britain and more recently the United States, the Church has faltered. Even those Irish still here seem uprooted in a way, almost anxious to distance themselves from their own traditions. Last year Ireland became the first nation to redefine marriage by popular vote, and its pro-life laws are under constant attack, with some setbacks in recent years. The fact that attacks on Ireland’s traditional Christian values are funded by foreign “progressive” billionaires like George Soros is not lost on anyone, but truth be told, the famous Irish fighting spirit isn’t what it used to be. Except in a precious few. 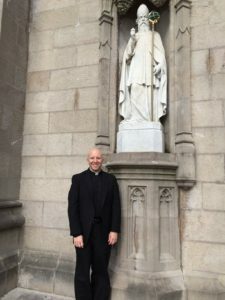 During these mission trips I get to meet many people, and I am blessed to have real conversations with a few individuals and groups who see Ireland’s patron saint, Saint Patrick, as their exemplar. What I’m hearing is pretty consistent. For most, it appears, the Faith slowly became merely cultural. After forty years of indifference and inadequate catechesis, unchecked dissent from Church teaching (particularly concerning contraception–even from the pulpit), almost two whole generations have lost the faith. When the corruption of the abuse scandal hit Ireland, the remnants of cultural Catholicism were not enough to shore up people’s faith, and there has been a mass apostasy. If this course remains unaltered and people continue to reject God and His commands, our friends say, a third generation will be lost, followed by Ireland herself. To paraphrase a conversation I had with a local leader: We are known as the land of saints and scholars who sent missionaries around world, but we have rejected this rich legacy, embracing instead the way of Europe and America. And at what price? The death of our Catholic faith, our families, and our children. When will we learn as a Church? There is a world of difference between a faithful and fearless Catholic who does all he can to meet the culture where it is and bring the Faith in creative ways, and a Catholic who thinks that where the world and the Church disagree, the Church must change her ways in order to appear “relevant.” The former is the life of the Church, the latter, a slow death. We clergy and leaders of the Church must be about souls. We must preach the love and mercy of Our Lord. This Love isn’t merely the love of a buddy: it is the love of a Man who died for our sins in the most brutal manner. He was relevant—and is relevant—precisely because He could not care less about being relevant. His love was sacrificial and complete. It is THIS love, THIS Person, that is our model. God gives us so many models of this radical love that transforms the world. We just had an occasion to honor Mother Teresa of Kolkata. The Church’s newest canonized saint is an example of one who loved fearlessly, and who was relevant not despite, but because of, her lack of concern with conforming to the world. We also just celebrated Padre Pio’s feast day—how relevant was he? And if he was relevant, was it because he “got people in the door” or because he brought the Faith to the world in a radical way? The glory of God is not only man fully alive, as St. Irenaus so beautifully put it. It is man whose will is so conformed to God’s that he is ready to die for love, to sacrifice all for souls. If we priests and our shepherds see our vocations in this way, God can use us to set the world on fire–not only getting more people in the door, but sending them back out to work for love and justice. They will shut down abortion clinics and put the fear of God into politicians with a peaceful and articulate witness to life. They will open pregnancy centers to help women choose life, and they will preach the social and moral doctrine of the Church in harmony with the Gospel, showing how love demands we end the sexual revolution with a counterrevolution of love. They will show men how unmanly it is to treat women like objects to be used, and show women that they won’t find love in hookups. A well-formed people can go out to the world and find creative ways to change it, and not seek endlessly for ways to change the Church and her doctrine to make the Church seem less offensive. When will we learn that caving to the world brings not peace or conversion, but confusion and even greater hostility to faithful Catholics? Catholics who are well formed in the faith want justice and will work hard for it. They will build solid families that do not need government assistance, and will not seek ever more government to save them from the consequences of their own choices. They will not let the poor and marginalized in their own communities suffer, but will be present to them. They will not have abortions, and will not tolerate this evil in their communities. They will live a witness of true and natural marriage, even with all their flaws, because they remain faithful. They will freely join and support institutions that serve the community well, and they will be generous with whatever wealth they are given. Their society will be more just because they first learned how to love in their families and from priests who were unafraid to tell them the truth and be examples of joyful, Christ-like, sacrificial love. They will also know how to vote. This is what a Catholic society looks like, and it is a society that can handle and not squander its freedom. Seeing Ireland’s Catholic faith and society collapse is heart breaking, as is seeing the government grow into the areas that a free and faithful people used to take upon themselves. In America we see the same thing, even to the point where Catholics think that more of the obviously corrupt and incompetent government is still the proper “first response” for us care for the weak and marginalized. We need to wake up. I am with people in Ireland who are awake and are fighting, but who for the most part do not feel as if they have the Church backing them. They have a tough road, but this land has seen saints before. While we have breath, there is always time to act for those whose hope is in the Lord. Thank you for supporting this mission and our partners around the world! It is an honor to serve in this battle with you all. Posted in HLI News, News & Commentary. Tagged Europe, Ireland, Spirit and Life. Speaking as an Irishman, I remember when the churches were packed in the 40s and 50s. However we did not realise at the time the treasure we possessed. We could be in and out of Mass in 25 minutes. Today about 50% of the priests are in open opposition to “The Magisterium” and are proud of it Most of the remaining priests feel burnt out and lack enthusiasm. Our bishops lack the will to fight. The days are gone when we were so excited on seeing St John Paul’s plane waggle its wings in acknowledgement of the million souls present in the Phoenix Park to greet him on his Papal visit. Remember ! all is not lost! The Good Lord and Mary, The Queen of Ireland is still in charge.